Is Maisel’s original photograph science? Fact? Biographical? Historical? It might be biographical and historical, but I’ve gotta side with Maisel on this one: it’s a creative work and thus falls squarely against a fair use finding. No fair use: strike one. It used Maisel’s whole photograph. But it didn’t use the whole resolution. Baio points out the absurdity of this component of fair use: where do we draw the line on the resolution? The reason why courts find fair use even where the entirety of an image is used is because fair use has more than just the third factor! I’m sure that were fair use only the third factor, it wouldn’t be fair use to use the whole image. Big. Huge. (thanks for that one Tiger) Obviously, a pixel isn’t copyrightable. But a series of pixels, strung together, can be— and Baio’s string looks suspiciously like a sequence of unprotectable elements that end up being protected. No fair use: strike two. No one in their right mind was considering buying Maisel’s photo of Miles Davis, saw Baio’s album cover, and bought that instead, destroying the market value of Maisel’s photo. Or at least, no one would have prior to this lawsuit. But this whole press debacle probably cost Maisel’s work a lot of value. Fair use! Baio’s still alive! OK, so it all comes down to the transformation issue after all. Did Baio’s piece transform Maisel’s work into something new? I really wish this one had been settled in court, by a judge, who would have had to write an opinion. This settlement denies us the richness of a judgment to refer to in future cases. Instead, I’ll just have to ask myself if there’s new expression or meaning in a pixelated photograph. 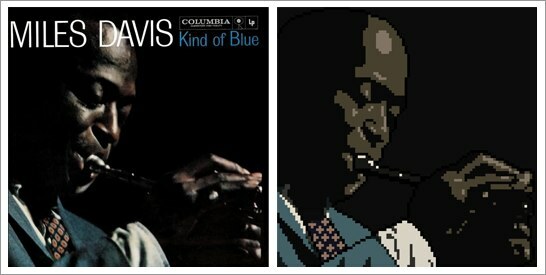 In context, as an album cover to an 8-bit Kind of Blue, it adds meaning and transforms without stepping on Maisel’s toes. But on its own, I’m uncomfortable with a ruling that would lead to art that has merely had its resolution changed to leaping from the artist’s control into anyone with a copy of Photoshop. Fair use, once and for all. But that unofficial-Max-Cho ruling has no standing anywhere except my own mind. And it doesn’t mean that resampling an image alone constitutes fair use: due consideration must be given to the transformation of the message— if something truly new is communicated. Sorry Andy Baio, and sorry Jay Maisel for this rough legal ride. I doubt it was a pleasure for either of you, and am saddened and irritated by a legal process that leaves both parties upset, society pissed off, and the world less one fine album cover. I’d like to remind everyone that copyright doesn’t exist in a vaccum: copyright is granted to “promote the progress of science and useful arts.” Any fair use issue whose decision fails to promote the progress of science or useful art is a bad fair use outcome, and I think this is a prime example. It cost both Maisel and Baio a lot of money, harmed two artists, and left the spectators dissatisfied and concerned, and angry. There’s gotta be a better way. Ther eis an important distinction here that I think you’ve missed: the cover for “Kind Of Bloop” was not simply Jay Maisel’s picture at a lower resolution. It is true “pixel art” whereby the color of each pixel was chosen by hand by an artist. Simply lowering the resolution of the original photograph would not generate the resultant pixel art image. If you find all this pixel art stuff arcane, imagine if a gifted draughtsman had made a pencil and ink drawing on paper that was so perfectly executed that when scanned and not looked at closely it resembled a black and white version of Maisel’s photograph. Would that change the legal analysis? That’s a point that I didn’t include, but you’re both right— it isn’t mere resampling. I believe resampling alone would not count as transformative, and mere resampling would have weighed heavier against this item as transformative. But for me, the most important idea in fair use isn’t the modulation technique— it’s if the meaning of the work substantially changed. Mere algorithmic resampling might still be transformative, especially depending on if a clever technique of resampling is used. Similarly, vectorizing a copyrighted work might also be transformative (and might not be) because there’s plenty of room for promotion of “progress of science and useful arts” in creative algorithms. The law being what it is, we’re stuck with a standard of fair use that’s arcane and nebulous, one in which inefficiencies in the legal system frustrate both rights holders and would-be fair-use-ees. And that’s really what I hoped the Maisel-Baio dispute would turn into— instead, it seems we got mostly bashing of Maisel (apparently artists, the ones who copyright is supposed to help, aren’t socially permitted to bother other artists even if they feel harmed).